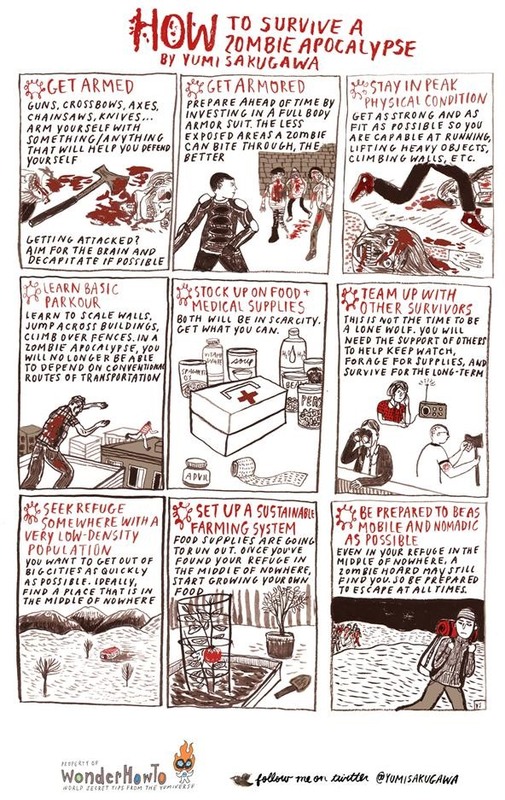 What should you do in case of a major zombie outbreak? Many of the best survival techniques follow the same logic as to how you should prepare for major natural disasters; stock up on food and medical supplies, have an escape route, and form a community of people you can work with. When you're dealing with the flesh-eating undead, it also helps to invest beforehand in full body armor, weapons, and basic parkour lessons so that you know how to scale walls and jump across buildings when a horde is chasing you. Good running shoes is also not a bad idea. Got your own tips for surviving the zombie apocalypse? Share with us in the comments below. fack knowledge for fack phinomina. stay away from full auto weapons. anything with really loud sounds. .22 and 7.62x w/e are great round because they are so easy to find. 45's are good, and most shot guns just don't quite hold enough ammo. Zombies? Are they even real? Not to my knowledge... but you never know. Hoping that I won't be among the zombies.